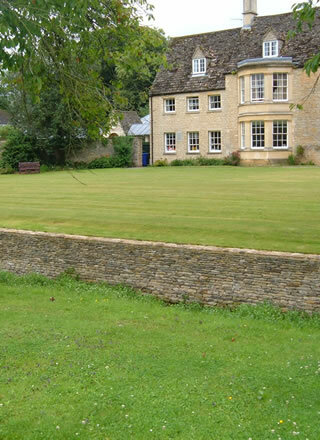 This wall was constructed as a ha ha retained wall, using the original Cotswold stone at Begbroke, Oxfordshire. The retaining wall design included suitable strengthening and drainage requirements. Our retaining walls are built to various designs as structures to hold back raised ground. The wall can be constructed as a wet or dry stone wall. We will liaise when necessary with structural engineers to ensure the structure is designed to meet the required purpose. We will work to any conservation and planning requirements. These retaining walls were designed and built to create a sunken garden using reclaimed weathered stone at a property in Wheatley, Oxfordshire. Hydraulic lime mortar was used in this construction to fully comply with conservation regulations. The design for this retaining wall incorporated strengthening, drainage and lighting. This retaining wall was rebuilt due to disrepair using the original Cotswold stone, in Cumnor, Oxfordshire. The wall was reinforced using concrete and steel to the structural engineer�s specification.